In 2008, the shares of individual fuels in electricity production changed strongly, which is a consequence of the operating of the nuclear power plant without repair work and an increase in the use of RES. However, Slovenia still produces most of its electricity from coal. Due to the reduction in electricity consumption and record production, meeting the needs did not present a problem. Electricity production by fuel is an important indicator of the trend of emissions, since it contributes approximately one third of the total greenhouse gas emissions and total powdered emissions (secondary: SO2, NOx, NH3; primary: PM10). In light of the emissions, the environment is mostly polluted by electricity production from fossil fuels; however, there are differences also among fossil fuels. Namely, gaseous fuels are the most environmentally-friendly fuels, since with regard to solid fuels they have approximately 2-times lower greenhouse gas emissions. Liquid fuels are, with regard to emissions, somewhere between solid and gaseous fuels. The nuclear energy use does not cause any emissions; however, it is problematic due to the hazard of nuclear disasters and accumulation of nuclear waste, which represent a huge environmental problem. The most environmentally-friendly form of electricity production is based on renewable energy sources; however, naturally this does not mean that their consumption does not influence the environment. Besides the structure of electricity production by fuel, the efficiency of production also influences emissions. The driving force behind electricity production is its consumption, which has been increasing strongly in the last period. This also influences the increase of electricity production, while emissions are smaller due to the replacement of fuels and improvement of production efficiency. The majority of electricity in Slovenia is produced in the nuclear power plant at Krško; however, due to dual ownership (half to Slovenia and half to Croatia), half of the electricity belongs to Croatia. Taking this into consideration, the majority of electricity in 2008 was produced from solid fuels (lignite and brown coal), followed by renewable energy sources, nuclear energy, gaseous and liquid fuels. Total electricity production in 2008 amounted to 16,398 GWh; and considering half of the production of the nuclear power plant was 13,262 GWh (in further analysis, electricity production is considered with half of the nuclear power plant). With regard to 1992, electricity production was higher by 31 %, and with regard to 2000 by 18 %. With regard to the previous year, electricity production increased by almost 9 %. The average annual growth of electricity production in the period 2000-2008 amounted to 2.1 %, which is a little under the average annual growth of final energy consumption, which amounted to 2.4 %. In 2007, the situation was totally different, since the difference in the growth of production and consumption was a lot bigger (production 1.2 %, consumption 3.4 %). In 2008, the significantly higher electricity production and reduction of consumption also influenced the smaller net share of needed electricity from import. In 2007, imports amounted to 20 %, which is close to the threshold set by the Resolution on the National Energy Programme for the objective of supply reliability (direct import dependence for electricity should not exceed 25 % of annual consumption). In 2008, this share decreased to 10 %, which is, after 2000, the third lowest value. The share of electricity from RES significantly increased (to 29.1 %) in 2008 with regard to the previous year; in this way, it derogated from the objective by 4.5 percentage points. The increase in the share is a result of the record electricity production from RES in the amount of 4310 GWh. Electricity production from solid fuels in 2008 amounted to 5323 GWh. Up to 1996, it practically did not change; however, it increased in the following period due to the need for electricity during the conjectural period, which followed the economic recession from the beginning of the nineties. In 1999, production decreased due to the interruption of electricity supply from the Krško nuclear power plant to Croatia; as a result, the supply in Slovenia increased. In the following period up to 2002, there was again an increase in electricity production. The increase in electricity production after 1999 was primarily a result of the significant growth of electricity consumption, largely due to the start-up of additional electrolysis in the primary aluminium production plant in 2002. 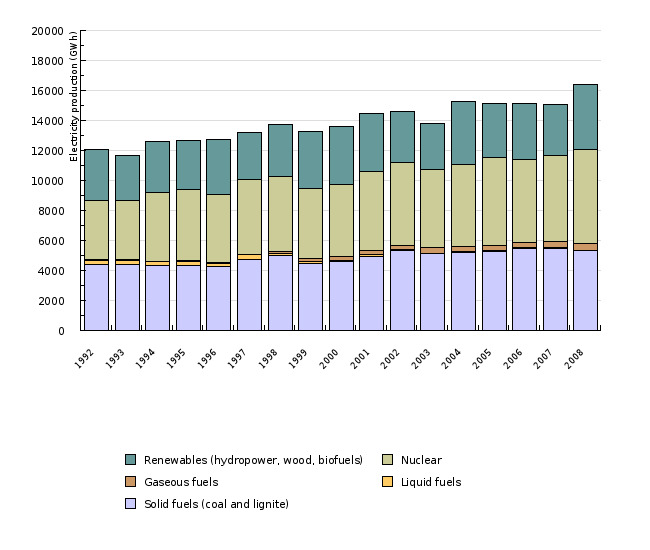 In the following years, production remained almost at the same level, with the exception of 2008 when it decreased due to large production from RES and the nuclear plant and reduced consumption. The share of produced electricity from solid fuels in 2007 amounted to 45 %, while in 2008 it decreased to 40 %. This is 1 percentage point less than in 2000. Half of electricity production from nuclear energy in 2008, an amount of 3137 GWh, represented 24 %. 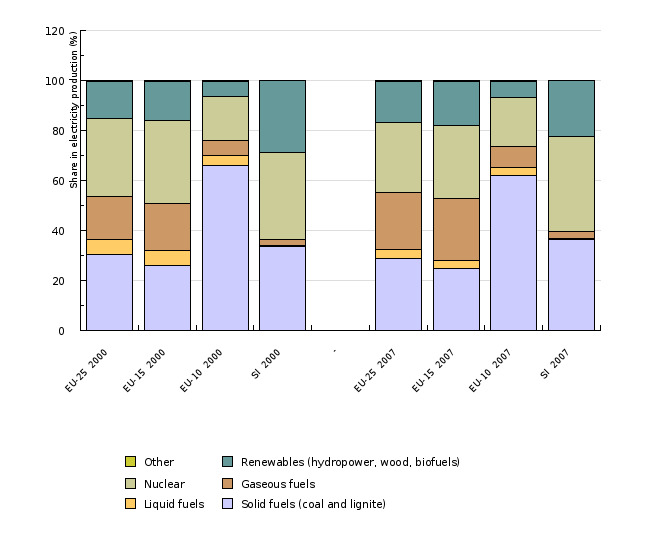 The increase in production (with regard to 1992, by 58 %) is a result of the optimisation of operations with the shortening of repairs, introduction of an 18-month fuel cycle (2008 was a year without any repair work) and improvement of equipment (replacement of evaporators, turbines, etc.). Due to cooling with water from the river Sava, the production of the nuclear power plant was also dependant on hydrologic conditions, which was noticeable in 2003, when production, with regard to 2002, decreased due to a low water stage. Electricity production from natural gas and liquid fuels represents a minimum share in total production. In the past, a decreasing trend of electricity production from liquid fuels was noticeable on account of an increase in production from natural gas. This is largely as a result of the replacement of fuels of autoproducers. The increase in electricity production from natural gas in 2007 and 2008 is a result of higher electricity production in the Brestanica thermal power plant (2007), new turbines in the Šoštanj thermal power plant (2008) and especially due to bigger production in CHP units (2007 and 2008). In 2008, the first step in the technological renovation of thermal power plants was made after a long time, since gas turbines were added to the largest blocks of the Šoštanj thermal power plant. As a result, coal block 2 was suspended. The higher influence of the turbines on electricity production will be indicated in 2009, since in 2008 they operated only within a pilot period (Šoštanj thermal power plant, 2009). Due to the future continuation of urgent technological improvements of thermal power plants, larger changes in the shares of produced electricity by fuel are expected; namely, an increase in the share of electricity from natural gas on account of the share of electricity from solid fuels. The project of a gas-steam unit at the Ljubljana thermal power and heating plant location is also in progress; according to the plans of the company, it will be finished by 2012, while the gas project at the Trbovlje thermal power plant location is currently uncertain. At the beginning of 2010, a new National Energy Programme was prepared. Changes towards more environmentally-friendly electricity production are also encouraged by the current regulations in force. The CO2 emission allowance trading system, through the purchase of additional market rights, promotes the reduction of CO2 emissions and the consumption of environmentally-friendly fuels (natural gas, RES). The Decree on emission limit values discharged into the atmosphere from large combustion plants with limit values of SO2 and NOx emissions requests from the electricity producers an implementation of measures of reducing the emissions of air pollutants (desulphurisation, primary measures of the reduction of emissions of NOx, deNOx, etc.) or a transition to environmentally-friendlier fuels; furthermore, the environmental protection permit promotes the use of currently best available technologies. Electricity production from renewable energy sources and CHP plants is promoted by the system of redemption prices of electricity. Besides the indicated instruments, active promotion of efficient consumption is also very important, since it will lead to a lower growth of consumption and reduced pressure on electricity production. In 2007, electricity production from nuclear energy prevailed in the EU-15. It was followed by electricity production in thermal power plants run on solid fuels and natural gas. Production from renewable energy sources represented 18 %. 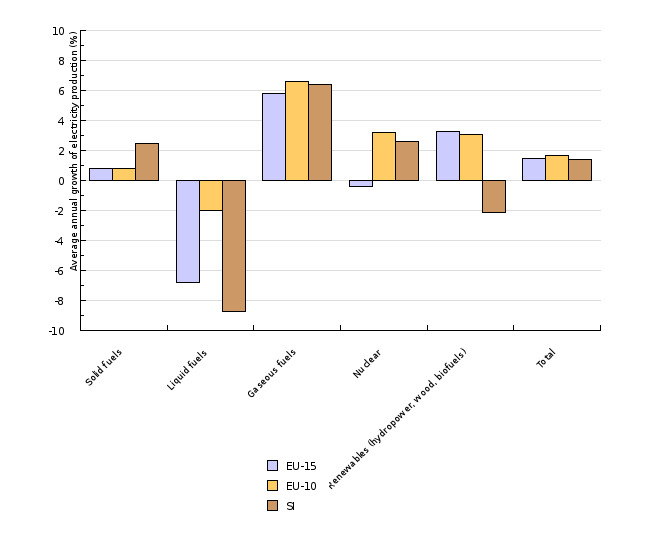 In the EU-10, the production structure was completely different; namely, production from solid fuels strongly prevailed, followed by production from nuclear energy. The production shares from natural gas and renewable energy sources were lower than 10 %. Slovenia differs from the EU-15 primarily with regard to the minimum production share from natural gas and higher production share from solid fuels, nuclear energy and RES. The trends of electricity production in the period 2000-2007 indicate a more sustainable electricity production in the EU-15 states, since the production from RES and natural gas has significantly increased. 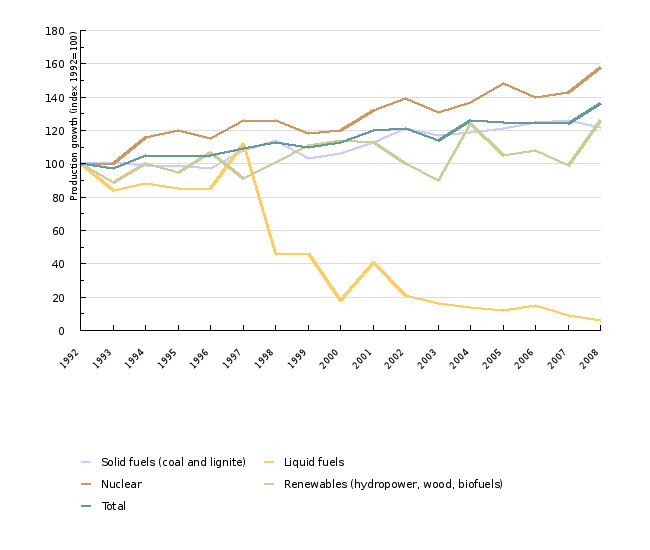 The production from solid fuels increased only slightly, while the production from nuclear energy decreased. The same applies for the EU-10 with the exception of nuclear energy. In Slovenia, the production from solid fuels has strongly increased, while the production from RES has decreased.